We just started A Child's Geography by Ann Voskamp today. No, this isn't a review! One of the activities for each chapter is to create a picture postcard to share with your family and friends what you are learning. 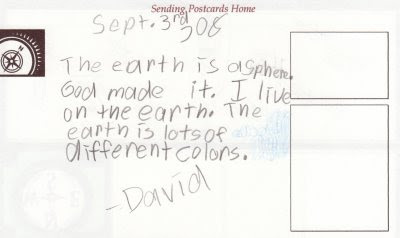 So, I'm sharing the postcards the kids made with their family and friends. 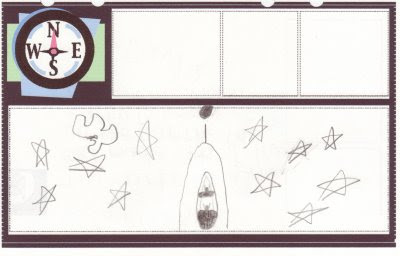 David's picture is a closeup of a spaceship carrying the Hubble Telescope and heading back to earth. 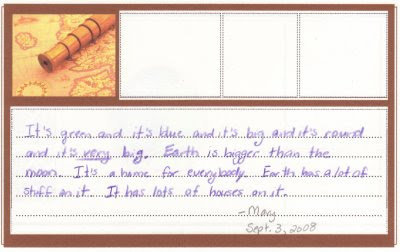 Mary's is the earth: the blue patch at the top is the sky and then she divided the earth in half for water and land. Mary dictated to me what she'd like her card to say...David said he was writing his simply so that even Peter could understand it. 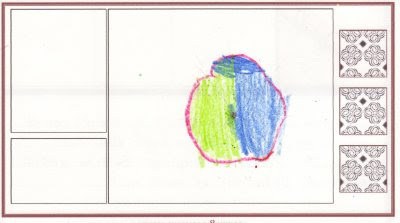 When I pointed out to him that Peter can't read and his Grandparents can and aren't two-years-old, he compromised by changing "ball" to "sphere." I know this wasn't a review, but this looks like an engaging and interesting program. Are you happy with it? What does it cover and in what order? How does it address teaching different levels at the same time? Does it always need teacher interaction or can the student complete some lessons independently (if appropriate)? Ha Ha! You don't have to answer these questions if you don't want to. I am on my third geography program and everyone I try is too "cutsie" and lacks substance. And I need an actual program in order to hold myself accountable. I tried the Montessori approach and the problem is that with no lesson plans we never did geography if I was tired, the kids were tired or we needed a break.